Ready to file for a permit? The first thing you should determine is if your submission requires Zoning. Zoning permits are issued for most external changes proposed to a property (steps, pools, sheds, garages, driveways, walkways, patios, decks, porches, etc.). For a complete list of what requires a zoning permit, click here. IF YOU REQUIRE ZONING: File a Development Permit Application. Be sure to fill out all of the application and specify what you are applying for, the dimensions and include a property survey showing the setbacks from all property lines (if applicable). IF YOU DO NOT REQUIRE ZONING: Skip to Step 4. Applicant assembles and submits a completed Development Permit Application and all requirements to an intake staff member at the Building Division. Checklist requirements are verified. All zoning applications require a $20 fee. Historic Preservation is at the heart of our community. If the property you are applying for is historic, please STOP this process and click here. Plainfield's Zoning, Building, and Inspections Divisions work hard to keep applications moving quickly. All applications require between 20-30 days to be processed. Please allow for 30 days for all new businesses applying to be opened. The Zoning Office will review your application for conformance with the Land Use Ordinance of the City of Plainfield as well as the Municipal Land Use Law of New Jersey. Certain applications, such as businesses, require inspections that will also be done by the Zoning Office. If your application is denied by the Zoning Office, please read the denial letter and respond with any missing information or with an application for a variance from the Zoning Board of Adjustment if you wish to file for such. Please allow the Zoning Office 10 days to respond to your application. The Zoning office will respond in an approval or denial format. Certain improvements, such as driveways and fences do not require building permits and can therefore stop at this steps. All others continue onto Step 4. If your application is approved by the Zoning Office or does not require zoning review, then you may proceed to the Building Division. The Building Division receives all approved applications from the Zoning Office automatically, so there's no need to call or take the folder from one office and give it to another. If you do not require Zoning, you begin your application at this step. 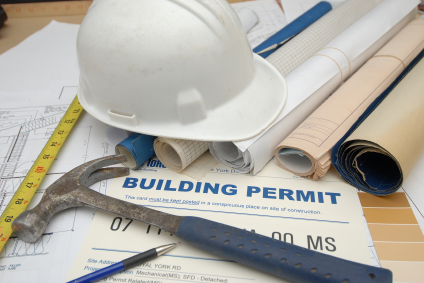 You must go to the Building Division and submit your permit cards (electrical, building, fire, mechanical, or plumbing) and a copy of your builders license to the clerks (licenses required only for multifamily or commercial properties). The Building Division requires (5) five days to process and price all permits. Once the five days are over, the division will call you to alert you to come and pay for and receive your permits. All permits and application fees must be paid for prior to receipt and can only be paid for in cashier's check, money order, business check. No personal checks, credit cards or cash is accepted. If you are applying to open a business, the Code Enforcement Office requires you to file a Certificate of Compliance for a Rental. The cost is $300.00. The "CofC", as it is called internally, is a certificate that is issued to certify that the inside and outside of an establishment is up to par with the Plainfield Property Maintenance Code (PMC). If your location does not meet the PMC, then you or your landlord will be required to make improvements prior to occupancy. No occupancy is permitted without a Certificate of Compliance for a Rental and a Zoning Approval. You will now receive inspections from the Building Division. You must call and make an appointment 10 days prior to the day you wish to have the inspection. Please plan accordingly! An emergency on your end does not constitute an emergency to the City! Also, please note that the date you wish to have the inspection may be unavailable. Please have a backup date in mind when contacting the Building Division. If you pass Building Division inspections and sign-offs, you are officially done with the process! Be sure all fees are paid with the Building Division. Enjoy your new improvement!